First: She must go to Robert de Baudricourt at Vaucouleurs. Second: She must win back France from her enemies. Third: She must lead the Dauphin to his anointing at Reims. How these things were to be brought to pass she did not know. The walled town of Vaucouleurs lay some twelve miles to the northward of Domremy, and was the chief place of the district. Its captain, Robert de Baudricourt, was well known throughout the Valley of Colors. He was a blunt, practical man of the sword, who had married two rich widows in succession, and who had been fighting since he could bear arms, in the reckless wars of the Lorraine Marches. He was brave as a lion, coarse, rough, domineering, an ideal soldier of his time and country. Jacques D’Arc had had personal dealings with him in the Spring of the previous year when he had appeared before him to plead the cause of Domremy against one Guiot Poignant, and he had many tales to tell of the rough Governor. How could she approach such a man? There was no hope of help at home. That she foresaw clearly as she recalled her father’s words concerning his dream. She knew that he would oppose her bitterly. Nor would her mother aid her, deeply as she loved her, to go contrary to her father’s will. Neither would they allow her to journey to Vaucouleurs unattended. The maiden made a mental review of the villagers in search of one to whom she might appeal for assistance, but rejected them sadly as their images passed before her. Clearly she must bide her time. Just at this juncture, when she knew not to whom to go, Durand Lassois, a cousin by marriage whom she called uncle because he was so much older than she, came to Domremy on a visit. Jeanne hailed his advent with eagerness. He lived with his young wife, who was Isabeau’s niece, in Bury le Petit, a hamlet lying on the left bank of the Meuse in the green valley, nine miles from Domremy, but only three from Vaucouleurs. Here was the help that she needed, for Durand was fond of Jeanne, and would do her bidding as unquestioningly as a mastiff obeys the child whom he adores. So when Jeanne, taking him aside, asked him to take her home with him for a visit to her cousin, his wife, he assented readily. 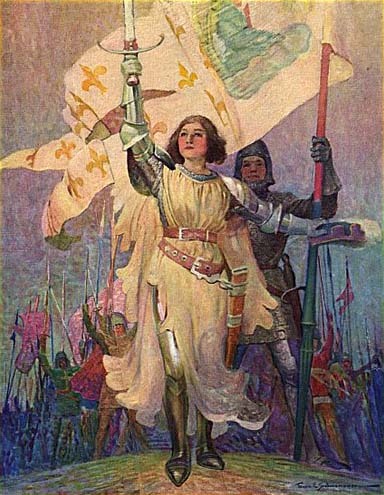 Jacques D’Arc made some objections when the subject was broached, but Isabeau was pleased and over-ruled them. “It must be for only a week, then,” said Jacques. “You wish me to do what, child?” he asked in open-mouthed amazement. “What for?” demanded Lassois, staring at her. Into the peasant’s honest face there came a troubled expression. Slowly he passed his hand across his brow, then stopped in the path and looked at her. “I am that Maid, Uncle Durand. I shall save France.” She spoke in a tone of quiet conviction. The man drew a long breath and stared at her. He had known the maid all her short life. Knew of her good deeds, her purity and truthfulness; knew that all that could be urged against her was the fault of going to church too frequently. So now, as he noted the clearness of her eyes and the calmness of her manner, he told himself that she believed what she said, and that whatever might be the nature of her affliction it was not madness. “I know, uncle, but it is the will of God. I must go,” she told him. Involuntarily Lassois crossed himself. There was such a look of exaltation about the maiden that he felt as though he were in church. “Then why go to him?” he demanded bluntly. So the compact was made, and Jeanne had found the way to make the first step toward the fulfilling of her mission, and the journey was finished without further incident. However, it proved not so easy to leave for Vaucouleurs as she supposed it would be. Lassois and his young wife lived with her parents, the wife’s mother being Isabeau’s sister was therefore Jeanne’s aunt. Both mother and daughter welcomed their young kinswoman with delight, and took such pleasure in her society that they were unwilling that she should leave them even for a day. Thus four days went by before Durand was able to fulfill his promise. It was managed at last, however, and the maiden’s heart beat high as they left Bury le Petit behind them, and set their faces toward Vaucouleurs. Being but a three mile journey it was quickly made. Though born and bred in the valley it was the first time that she had ever seen the grim little fighting town where Robert de Baudricourt upheld the Standard of the Lilies against that of the Leopard. Therefore she looked about her with natural curiosity. The width of the valley lessened here. The hills pressed so closely upon the river that the meadows lay at the very feet of the town. Within the walls the buildings clustered round the base of a hill upon which stood the castle of the Governor and the church, overlooking the vast extent of hills and dominating the valley. Without difficulty they entered the town, and climbed one of the narrow streets leading to the castle. The gates were open, for the bluff Captain was easy of access to his followers and townsmen. A number of soldiers were scattered about the courtyard burnishing armour, sharpening swords, and all as busy and merry as valiant men-at-arms should be. They cast curious glances at the pair, the rustic countryman and his fair companion, but on the whole were civil enough, permitting them to pass without hindrance into an ante-chamber of the castle. “Shall I not speak to Sire Robert first, Jeanne?” questioned Lassois, who became all at once awkward and diffident. Secretly he hoped that the Governor would refuse to see his young kinswoman. He feared his ridicule. Jeanne shook her head. “The Sire Captain says that you are to come to him. This way.” With this he conducted them through many a windy passage to the banqueting chamber. A long table extended its length down the centre of the room, and around it were gathered the officers of the garrison. At the far end of this table stood a smaller one elevated above the other by a dais. At this table with three companions sat a brawny, gray-haired man whom Jeanne knew at once was the Governor. Lassois, shy and ill at ease among so many gentles, stopped short just inside the door, and stood awkwardly twirling his cap in his hand. But Jeanne, who had been wont to tremble and blush before strangers, was in no wise abashed, but with noble and courteous bearing proceeded directly to the small table. Now it happened that just before Lassois and Jeanne entered the hall the Governor and his men had been discussing the state of affairs in the country. It was noised about that the English were preparing for a new attack in force on the Dauphin’s territories south of the Loire. It was rumored also that the little wedge of loyal territory in which Vaucouleurs lay was to be the object of special attack by the Burgundians. That a young peasant girl, accompanied by a rustic, should calmly inform him that she should straighten out the difficulties of distressed France appealed to Robert as a huge joke. So, at her answer, he gave way to a great shout of laughter in which his men, as in duty bound, joined. Sire Robert had no sentiment, but was possessed of a coarse humour. Again and again the rafters rang with his merriment. When the hilarity had somewhat subsided he beckoned Lassois to draw near. Whip her? Lassois turned a startled glance upon the Governor as though he had not heard aright. Whip Jeanne, who was so good and sweet? The very idea was profanation. Cowed and frightened he grasped the maiden’s arm. But calmly, courageously Jeanne faced the Governor. Mad though they deemed the maiden, the men-at-arms and their Captain were impressed by the girl’s gravity and noble bearing as she spoke. In silence, therefore, they permitted the pair to pass from the room.